Announcement: We are already booking Glacier National Park and West Glacier trail rides for 2019! Reserve now to ensure availability for your optimal rides and dates. Please note: The following riding tips, policies and restrictions are for your safety and the safety of those around you. Violation of any of the following may result in the immediate loss of riding privileges. Safety is our number one priority, and as a result, we reserve the right to refuse service to anyone who we do not believe to be mentally or physically prepared to handle the horseback ride. Glacier National Park can be crowded during peak season. This means that getting through the entrance gates, finding parking, and traversing from the east side to the west side (or vice versa) can take longer than expected. Please allow plenty of time for your activities as refunds will not be granted for late arrivals. Also, due to increased visitation to Glacier National Park during the summer months, occasionally the National Park Service has to manage entry into the Park via a “one car in, one car out” policy. If this happens, it is critical that you have a copy of your confirmation so that you can prove your need to enter the Park. Please print or download a copy of your confirmation and bring that with you. Note there is little to no cell phone reception in the Park, so you will need to be able to access the confirmation offline. 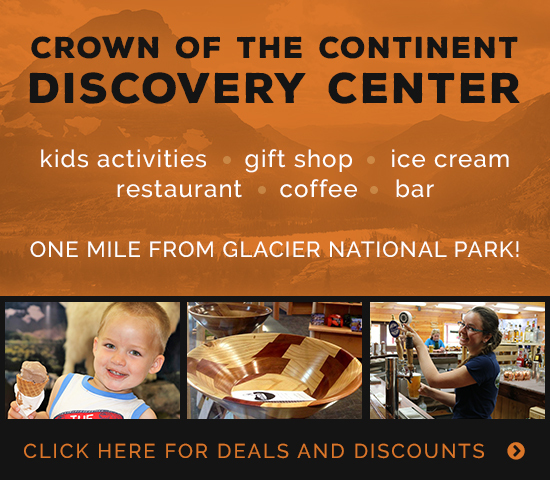 Food and drink are not provided for any rides inside Glacier National Park, however we provide a boxed lunch at our Crown of the Continent Discovery Center if you do not bring your own. Also, Sperry Chalet has a full service kitchen available to Sperry All Day riders. Lunches are available for $15 on the half day and all day rides out of our West Glacier Corral. Pack animals are available to haul gear up for guests of Granite Park or Sperry Chalet. Pack animals can carry a maximum of 150 pounds, but gear must fit in standard packing equipment (manty or pack paniard) and must be evenly divided on either side of the animal so that the load rides safely for packer and horse. Pommel bags are available for guests to carry minimal gear with them on a short duration ride (4 hours or less). Pommel bags have two small pockets each measuring about 4 inches wide by 6 inches tall and 3 inches deep. They are ideal for a water bottle, an EpiPen or other medication, keys or a wallet. Saddle bags are available for guests to carry minimal gear with them on a longer duration ride (primarily all day and overnight treks). Saddle bags have two small square pockets each measuring about 12 inches wide by 12 inches tall and 4 inches deep. They are ideal for a lunch, a first aid kit or small toiletry kit or a camera. Hiking poles (as long as they can collapse down to 3.5 feet), jackets and/or soft-framed day packs can be rolled up and tied to the back of the saddle as long they don’t rise up above the cantle of the saddle. No backpacks, purses or fanny packs can be worn while riding. Additionally, no straps can be worn around the neck (i.e. camera straps, binocular straps, etc.). Pommel bags and/or saddle bags are provided to carry minimal gear with you on the ride. Most importantly, obey your wrangler at all times; don’t ruin the ride for everybody else. 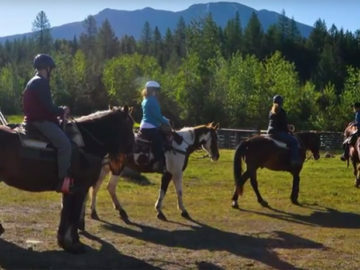 Swan Mountain Outfitters is authorized within Glacier National Park to provide guided horseback trail rides at Apgar, Lake McDonald and Many Glacier.